The Globe and Mail Editorial Board unanimously agreed to endorse a minority Liberal government for the Ontario provincial election but was overruled at deadline by Editor-in-Chief David Walmsley. Walmsley held the section up at noon last Friday for over two hours, costing the budget-strapped and job-slashing Globe tens of thousands of dollars as Editorial Board editor Tony Keller gnashed his teeth and squeezed out a forced endorsement for Tim Hudak’s Conservatives. The Globe newsroom was in miserable spirits today as Walmsley’s honeymoon came to an end. It is widely felt that Walmsley was carrying water for publisher Philip Crawley, who in turn was carrying out the orders of the Globe-controlling Thomson family, whose interests would be best served by a Conservative government. Q.How does the Globe and Mail go about giving an endorsement? According to CANADALAND’s source, every word of the above is true until the name Tim Hudak is mentioned. The Globe’s Ed Board put weeks of work and thought into arriving at the Wynne endorsement, and they are now baffled as to why they even bothered. This sentiment is shared throughout the newsroom. It was more than one staffer could take, to stand by passively as Walmsley piously held forth about the “certain values” that “the Globe and Mail stands for” while seemingly speaking on behalf of journalists he second-guessed and overruled at the behest of his masters. 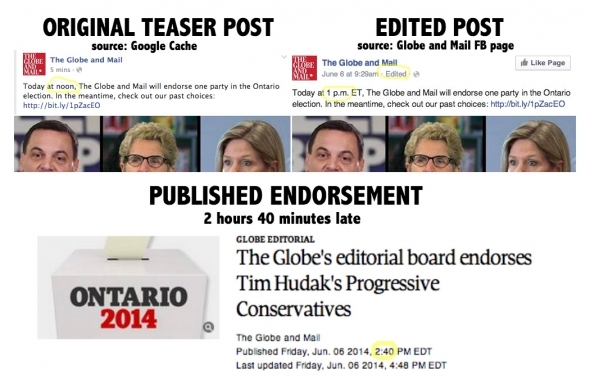 CANADALAND’s source points out a Facebook post issued by the Globe and Mail on Friday morning, promising the announcement of the Editorial Board’s endorsement by noon. The post was later edited (the original fortunately saved by Google Cache) to push the release back to 1pm. The actual didn’t appear until 2:40pm. For a decision that, as Walmsley describes it, was weeks, even months in the making, it sure seems like there was a mad scramble at the end to deliver it.